SparkPlan is the contract of physical operators to build a physical query plan (aka query execution plan). SparkPlan contract requires that a concrete physical operator implements doExecute method. doExecute allows a physical operator to describe a distributed computation (that is a runtime representation of the operator in particular and a structured query in general) as an RDD of internal binary rows, i.e. RDD[InternalRow], and thus execute. By default reports a UnsupportedOperationException. Executed exclusively as part of executeBroadcast to return the result of a structured query as a broadcast variable. The required partition requirements (aka child output distributions) of the input data, i.e. how children physical operators&apos; output is split across partitions. Defaults to a UnspecifiedDistribution for all of the child operators. Used exclusively when EnsureRequirements physical query plan optimization is executed (and enforces partition requirements). Defaults to no sort ordering for all of the physical operator’s children. SparkPlan is a recursive data structure in Spark SQL’s Catalyst tree manipulation framework and as such represents a single physical operator in a physical execution query plan as well as a physical execution query plan itself (i.e. a tree of physical operators in a query plan of a structured query). A structured query can be expressed using Spark SQL’s high-level Dataset API for Scala, Java, Python, R or good ol&apos; SQL. A SparkPlan physical operator is a Catalyst tree node that may have zero or more child physical operators. A structured query is basically a single SparkPlan physical operator with child physical operators. Spark SQL uses Catalyst tree manipulation framework to compose nodes to build a tree of (logical or physical) operators that, in this particular case, is composing SparkPlan physical operator nodes to build the physical execution plan tree of a structured query. The entry point to Physical Operator Execution Pipeline is execute. When executed, SparkPlan executes the internal query implementation in a named scope (for visualization purposes, e.g. web UI) that triggers prepare of the children physical operators first followed by prepareSubqueries and finally doPrepare methods. After subqueries have finished, doExecute method is eventually triggered. The result of executing a SparkPlan is an RDD of internal binary rows, i.e. RDD[InternalRow]. Executing a structured query is simply a translation of the higher-level Dataset-based description to an RDD-based runtime representation that Spark will in the end execute (once an Dataset action is used). SparkPlan has access to the owning SparkContext (from the Spark Core). execute is called when QueryExecution is requested for the RDD that is Spark Core’s physical execution plan (as a RDD lineage) that triggers query execution (i.e. physical planning, but not execution of the plan) and could be considered execution of a structured query. The could part above refers to the fact that the final execution of a structured query happens only when a RDD action is executed on the RDD of a structured query. And hence the need for Spark SQL’s high-level Dataset API in which the Dataset operators simply execute a RDD action on the corresponding RDD. Easy, isn’t it? Use explain operator to see the execution plan of a structured query. You may also access the execution plan of a Dataset using its queryExecution property. The SparkPlan contract assumes that concrete physical operators define doExecute method (with optional hooks like doPrepare) which is executed when the physical operator is executed. SparkPlan has the following final methods that prepare execution environment and pass calls to corresponding methods (that constitute SparkPlan Contract). "Executes" a physical operator (and its children) that triggers physical query planning and in the end generates an RDD of internal binary rows (i.e. RDD[InternalRow]). Used mostly when QueryExecution is requested for the RDD-based runtime representation of a structured query (that describes a distributed computation using Spark Core’s RDD). Internally, execute first prepares the physical operator for execution and eventually requests it to doExecute. Executing doExecute in a named scope happens only after the operator is prepared for execution followed by waiting for any subqueries to finish. Executes a physical operator in a single RDD scope, i.e. all RDDs created during execution of the physical operator have the same scope. prepare is also used recursively for every child physical operator (down the physical plan) and when a physical operator is requested to prepare subqueries. prepare is idempotent, i.e. can be called multiple times with no change to the final result. It uses prepared internal flag to execute the physical operator once only. Internally, prepare calls doPrepare of its children before prepareSubqueries and doPrepare. By default, the set of all attributes that are produced is exactly the set of attributes that are output. The naming convention for physical operators in Spark’s source code is to have their names end with the Exec prefix, e.g. DebugExec or LocalTableScanExec that is however removed when the operator is displayed, e.g. in web UI. Flag that controls that prepare is executed only once. Flag that controls whether the subexpression elimination optimization is enabled or not. FIXME SparkPlan is Serializable. Why? Is this because Dataset.cache persists executed query plans? resetMetrics takes metrics and request them to reset. executeQuery executes the input query in a named scope (i.e. so that all RDDs created will have the same scope for visualization like web UI). 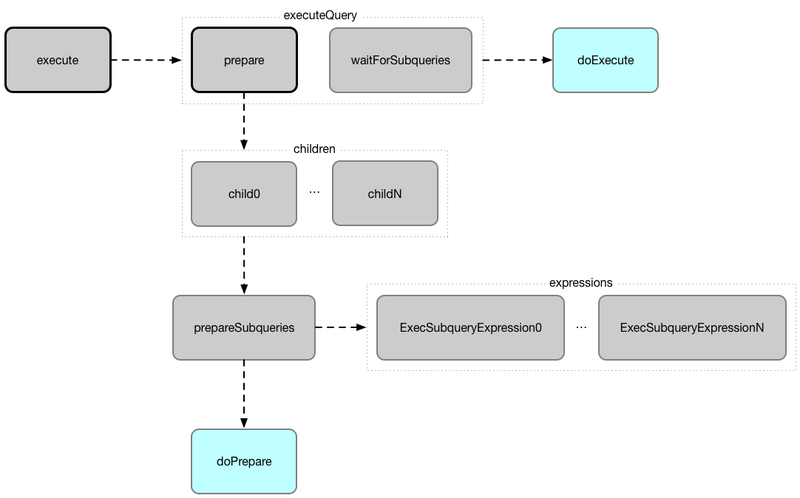 Internally, executeQuery calls prepare and waitForSubqueries followed by executing query. executeQuery is executed as part of execute, executeBroadcast and when CodegenSupport-enabled physical operator produces a Java source code. executeBroadcast returns the result of a structured query as a broadcast variable. Internally, executeBroadcast calls doExecuteBroadcast inside executeQuery. executeBroadcast is called in BroadcastHashJoinExec, BroadcastNestedLoopJoinExec and ReusedExchangeExec physical operators. metrics returns the SQLMetrics by their names. By default, metrics contains no SQLMetrics (i.e. Map.empty). executeTake gives an array of up to n first internal rows. Internally, executeTake gets an RDD of byte array of n unsafe rows and scans the RDD partitions one by one until n is reached or all partitions were processed. executeTake runs Spark jobs that take all the elements from requested number of partitions, starting from the 0th partition and increasing their number by spark.sql.limit.scaleUpFactor property (but minimum twice as many). executeTake uses SparkContext.runJob to run a Spark job. In the end, executeTake decodes the unsafe rows. executeTake gives an empty collection when n is 0 (and no Spark job is executed). executeTake may take and decode more unsafe rows than really needed since all unsafe rows from a partition are read (if the partition is included in the scan). range(start = 0, end = 20, step = 1, numPartitions = 4). // Think how many Spark jobs will the following queries run? executeCollect executes the physical operator and compresses partitions of UnsafeRows as byte arrays (that yields a RDD[(Long, Array[Byte])] and so no real Spark jobs may have been submitted). executeCollect runs a Spark job to collect the elements of the RDD and for every pair in the result (of a count and bytes per partition) decodes the byte arrays back to UnsafeRows and stores the decoded arrays together as the final Array[InternalRow]. executeCollect runs a Spark job using Spark Core’s RDD.collect operator. executeCollect returns Array[InternalRow], i.e. keeps the internal representation of rows unchanged and does not convert rows to JVM types. waitForSubqueries requests every ExecSubqueryExpression in runningSubqueries to updateResult. waitForSubqueries is used exclusively when a physical operator is requested to prepare itself for query execution (when it is executed or requested to executeBroadcast). outputPartitioning specifies the output data partitioning requirements, i.e. a hint for the Spark Physical Optimizer for the number of partitions the output of the physical operator should be split across. outputPartitioning defaults to a UnknownPartitioning (with 0 partitions). outputOrdering specifies the output data ordering requirements of the physical operator, i.e. a hint for the Spark Physical Optimizer for the sorting (ordering) of the data (within and across partitions). outputOrdering defaults to no ordering (Nil).